Sunday’s final round of the Jordan Spieth-dominated Masters ranked as the weekend’s overall top TV attraction -- and by a long shot, too. The 21-year-old Dallas native’s big win on golf’s grandest stage ran from 2 to 5:53 p.m. on CBS. It averaged 313,830 D-FW viewers with a peak audience of just over a half-million -- 502,128 viewers -- for the closing minutes. 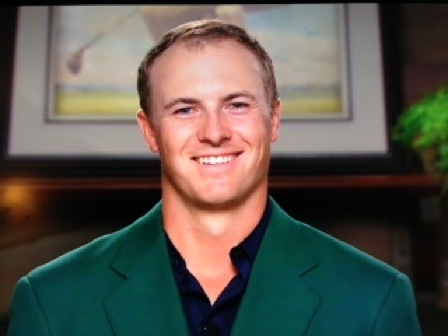 The climactic Green Jacket ceremony, which aired in the 6 to 6:15 p.m. segment, also scored big with 432,388 viewers. The Masters was a bit of a bogey, though, among advertiser-prized 18-to-49-year-olds. Sunday’s closing round averaged 50,461 viewers in this key demographic, That put it behind three prime-time Fox programs -- Family Guy (78,845 viewers), Fox4’s 9 p.m. local news (66,230) and the 8 p.m. episode of The Last Man On Earth (63,076). Fox’s 8:30 p.m. episode of Last Man and ABC’s Secrets and Lies tied The Masters in the 18-to-49 range with 50,461 viewers each. And in post-prime time, Gannett 8’s 10 p.m. newscast had a higher 18-to-49 yield (69,384 viewers). AMC’s Mad Men, now in its final seven-episode arc, continues to be largely ignored in D-FW. The new 9 p.m. episode stumbled in with 34,870 total viewers and 15,769 in the 18-to-49 demographic. Ratings were not immediately available for HBO’s 8 p.m. Season 5 launch of Game of Thrones. Saturday’s third round of The Masters was the day’s biggest draw in total viewers with 188,298. That easily beat Fox’s prime-time coverage of the NASCAR Sprint Cup race at Texas Motor Speedway (104,610 viewers). The 9 to 10 p.m. portion of the race also was outdrawn by CBS’ 48 Hours (125,532 viewers). The Masters likewise beat speed racing among 18-to-49-year-olds, ranking as the day’s No. 1 attraction in this age range. Friday’s Texas Rangers home opener, which started at mid-afternoon, averaged 90,662 total viewers and 31,538 in the 18-to-49 demographic on Fox Sports Southwest. The day’s top overall prime draw, CBS’ Blue Bloods, had 209,220 total viewers while CBS’ The Amazing Race led among 18-to-49-year-olds with 50,461. NBC5 ran first at 10 p.m. in both total viewers and 25-to-54-year-olds (main advertiser target audience for news programming). Fox4 swept the 6 a.m. races and added twin wins at 5 p.m. The 6 p.m. golds went to CBS11 in total viewers and NBC5 with 25-to-54-year-olds by a slight margin over Gannett8.